Herzog and cinematographer Peter Zeitlinger go to Antarctica to meet people who live and work there, and to capture footage of the continent’s unique locations. Herzog’s voiceover narration explains that his film will not be a typical Antarctica film about “fluffy penguins,” but will explore the dreams of the people and the landscape. They begin at McMurdo Station and interview some maintenance and support workers, as well as iceberg geologist Douglas MacAyeal. They travel next to a nearby seal camp supervised by zoologist Olav Oftedal. Next they join the film’s composer/producer, research diverHenry Kaiser at his diving camp, and interview cell biologist Samuel Bowser and zoologist Jan Pawlowski. Kaiser and Bowser stage a rooftop guitar concert. Herzog and Zeitlinger return to McMurdo for some more interviews, and visit the preserved original base of Ernest Shackleton. 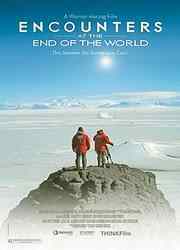 After some brief footage at the South Pole, Herzog interviews penguinscientist David Ainley. This footage includes a shot of a penguin marching in the wrong direction, walking to a certain death in the barren interior of the continent. Herzog and Zeitlinger next visit Mount Erebus, and interview volcanologists. A strange sequence follows which was shot in tunnels deep below the station carved from snow and ice. Various trinkets and mementos, including a can of Russian caviar and a whole frozen sturgeon, are placed in carved-out shelves in the ice walls, and preserved by the extremely cold and dry air. On the slope of the volcano, Herzog and Zeitlinger explore inside ice caves formed by fumaroles. The film next visits the launch of a giant helium balloon used in a neutrino detection project (ANITA) and features an interview with physicist Peter Gorham. The film concludes with some philosophical words from a maintenance worker, and more footage from the fumarole ice caves and Kaiser’s dives.